Pet Du Jour! : PLEASE HELP!!!!!!!!!!!!!!!!! Sorry, everyone, but I have another event for my daughter, plus, I am sooooooooo sick. Had a bad fever yesterday, and I feel it coming back. Feel like I've hacked a whole lung out-good thing I have 2! ML, I feel you!!!!!! This is really important everyone. If you know anyone in Houston or the surrounding areas, or know anyone that might be willing to travel to pick them up, let me or Deborah know. I will be posting the pics of the family for the rest of the week. Thank you all, and Good Luck, Deborah! 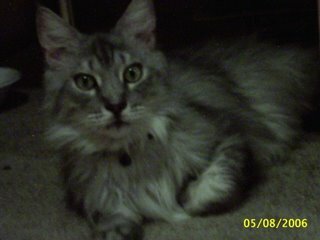 You're a great kitty mommy and an inspiration to all Friends Of Felines(c)!!!!!!! Beautifully done, thanks so much GS. We must have the same bug, you and I. But we'll come through for those cats, won't we. And Deb certainly is an inspiration to all, this was my first time to do anything like this. It won't be my last, thanks to Deb. And Karen C. did so much research (unasked) and provided so much help, resources and ideas. Thank you, Karen C.
Purrs & Huggles, Fuzz Pack! I wish I could help. I'll put the word out there as much as I can. What a wonderful thing that all involved is doing! This family deserves loving homes! GS, I hope you feel better!!! GS, are there any organizations that can help subsidize spaying and neutering? Can you talk to local vets about getting a discount? Get rested GS! You keep going and you're not gonna get well! Eye still feeling better? I sure hope by our joint efforts that someone will contact Debra! I can't imagine that someone from TX or nearby wouldn't see this! Between TDK, KP, Kat's Cat and here! Good luck little kitty family! Aaaawww...they are so cute! I wish I lived closer, I would take one, or two...ya I need another cat like I need a hole in the head...LOL...Good luck in finding them new mommies and daddies! I don't know if it will help or not, but I posted about the kittens to a running list I subscribe to (Dead Runners Society). There are people subscribed from all over the world...even Houston (just kidding Houston!). So maybe that will be another outlet to help spread the word. I asked them to come here to PdJ for more info and to see the pictures. I get so distressed when I hear about homeless animals - especially when they're going to be "put down". It's so great that Deb saved this beautiful family! ML - you're welcome. I'll do anything I can to help. GS - you're sick too? Sounds like there's a flu bug going around. Hope you're feeling better real soon. Since my 3 kitties were strays, one of the local rescue agencies gave me spay/neuter vouchers to have them fixed for free. Do you have a program like that where you live? Sounds like we'll need to get an adoption effort going for your colony soon too! What a bunch of sweet cuties. Sure wish I could help from out here in California but I can send prayers that you will find good homes for all of them. Deborah, you are so special for what you are doing for these kitties. They are all precious. GS, hope you feel better real soon. Just out of curiosity Deborah, how do you come about going to the SPCA to find these precious guys? I am completely overwhelmed by the feedback that I have gotten, as well as the help from Mary Lynn and everyone else. As to how I came to get my "fosters", my vet got a "tip" that this Mommy & babies were at the SPCA & scheduled to be destroyed. The babies were only a week old. She called me because she knew that I would help.Took me about 10 minutes to get there!So...Grace and Company have been living the "good life" as every kitty should in my master suite. They have had checkups and are perfect.My goal is to find great "forever" homes for them! I would love to keep them, but 10 cats (I already have 5) would be a bit much!I need to share with others!Thanks to all for prayers and well-wishes! Cat Lovers are the BEST people in the world!!! Fate, amazing isn't it!? Thanks for saving this family. I'm sure with all this publicity they are sure to find homes soon. I'm just so grateful to everyone for their wonderful & uplifting notes, as well as the help from "the kindness of strangers"! Grace, Marigold, Foster, Pete & Brutus send "meows" out to everyone! (my "forever" cats are Seaborne, Sam, Summer, Spats & Sassy. Seaborne was adopted on the beach where he was found in Seaside, Florida, while we were on vacation. Hence his name.One lb. of white fur with one green eye & one blue. Now he is 21 lbs. of white fur -- eyes haven't changed! He needed a friend, so Sam was adopted from Citizens for Animal Protection here in Houston. (West Wing Lovers will recognize the name! "Sam Seaborne") Summer was found in Seaside, Florida -- we go there every summer. 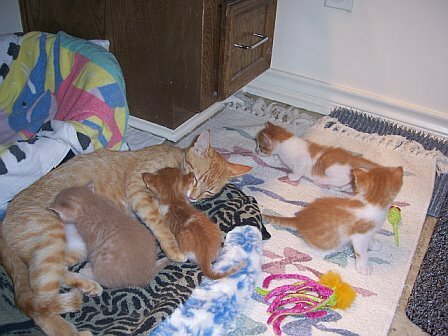 She was pregnant, so we took her in and kept her kittens too -- (Sassy & Spats.) They know that "OC's" (other kitties) are in the Master Suite, but are understanding and don't mind sharing their "human" with them! I keep them separated so that Grace won't feel threatened for her kittens. All the cats in my house (all ten of them) are spoiled rotten! As they should be! Thanks again to everyone! Watching the Fuzz Pack in action has been amazing. 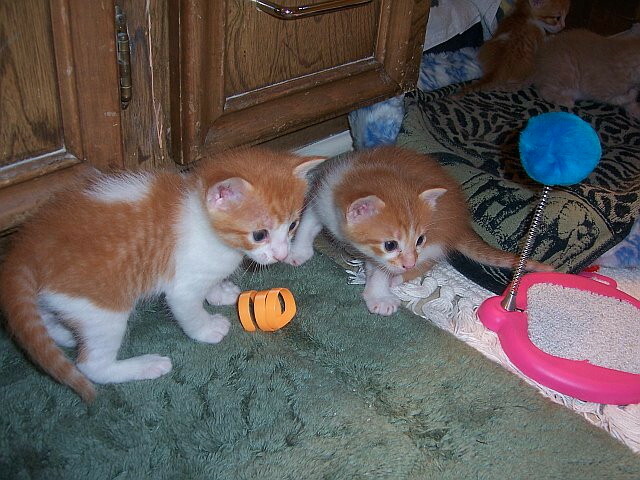 It started simple -- Karen C emailed that a "Deb" posted on TDK about a family of kittens in Houston that needed help. She knew I live in Houston. I emailed Debra. Debra emailed back with photos and info, we sent to Kat and GS -- and they dropped everything on their sites to post this cat family. Everyone is pitching in -- it's amazing. Reminds me of the saying: We may not have it all together, but together, we have it all! Mary Lynn, you are being quite humble! You literally got out of your sick bed to help with this effort! I love the "Fuzz Pack" label. Maybe we should do this more often! I will admit that fostering Grace & Company has been an effort, but one that I would gladly do again. These kitties are so sweet & lovable. 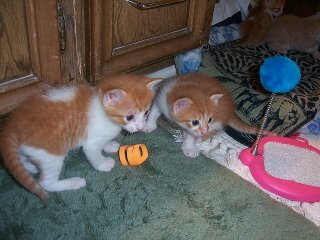 I have had such fun watching them grow from "ittie bitties" to kittens. Grace is such a lap kitty. All they want is love & care -- don't we all!